The active role of pastoral women should be recognised and reinforced as a key player to ensure livelihoods of pastoral communities. Denying women a voice deters the long term sustenance of the livelihood. There are over 200 million pastoralists worldwide, many of which are socially, economically and politically marginalized. Pastoralist women face further marginalization because of their limited role in decision making, despite their equal contributions to pastoral societies. Pastoralism is premised on three pillars: the family, livestock and natural resources. Denying women a voice deters the long term sustenance of the livelihood. The relatively weak position of women becomes evident when we look at their land rights. While they are at the forefront of managing rangeland resources, especially in places where men are increasingly leaving the rural economy in search of employment, they have no inheritance or selling rights. Growing privatization of resources further disempowers women and erodes the limited rights they enjoy under customary systems. While pastoralists have been increasingly vocal at the international level, the voice of pastoralist women is yet to be heard. They must constantly negotiate their access and control over natural resources and their ability to develop livestock activities. Institutional frameworks and supporting mechanisms must pay closer attention to women’s needs. Only with investments in women’s knowledge and skills, needs and priorities can empowerment be achieved. This panel will bring to the fore the oft ignored perspectives and experiences of pastoral women, and encourage discussion on how we can better support them. Ensuring access to natural resources and economic opportunities is key to empowering pastoralist women. This was the key message of an all-women panel that spoke at an event titled “Women’s empowerment for better resilience in pastoralist communities.” Organized by FAO’s Pastoralist Knowledge Hub, the event took place on October 12, on the sidelines of the 44th meeting of the Committee on World Food Security. 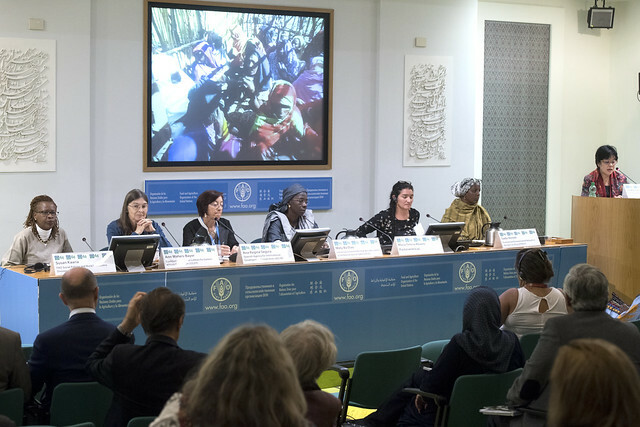 Marite Alvarez, a pastoralist from Argentina, and a member of the regional network Pastoramericas, brought to attention the marginalization of women through resource loss and large-scale land acquisitions. As men increasingly move towards urban centres in search of work opportunities, the burden of food production through agriculture and pastoralism falls largely on the shoulders of women. Still they do not enjoy secure rights over their natural resources. While local and customary resource management offered some protection to women, modern statutory tenure systems risk the loss of women’s control over resources as pointed out by Ann Waters-Bayer from the core team of the Coalition of European Lobbies for Eastern African Pastoralism. She offered some steps that civil society organizations could take to help strengthen pastoralist women’s access to resources, such as supporting women’s groups in claiming their rights, assessing if laws and policies are responsive to the needs of both men and women, and supporting appropriate education for pastoralist girls and women. National governments can play an important role in providing security to pastoralist women. Ana-Regina Segura from the Spanish Agency for International Development Cooperation discussed how countries could support pastoralism. She gave the example of the Spanish vias pecurias or livestock corridors that allow for the seasonal mobility of pastoralist herds. By mainstreaming gender across all their policies, AECID ensures that women have equal representation in terms of livelihood and resource rights. While access to natural resources is crucial, pastoral women must also have access to credit to develop pastoralist activities. “It is only when women have control over financial resources that they can influence decision making,” said Sadia Ahmed, the country representative for Somalia for the Pastoral and Environmental Network in the Horn of Africa. Susan Kaaria of FAO’s Social Policies and Rural Institutions Division gave the example of the “Accelerating Progress toward the Economic Empowerment of Rural Women” programme operating in the Afar region of Ethiopia with 500 pastoralist women run jointly by FAO, the World Food Programme (WFP), the International Fund for Agricultural Development (IFAD) and UN Women. It employs a holistic approach including financial and entrepreneurial skills training, adult literacy and credit management. An opportunity to use such training and finance is in developing pastoralist value chains, suggested Maty Ba Diao, regional coordinator of the Regional Sahel Pastoralism Support Project. For example, it could be used to develop the milk value chain that has traditionally had a large contribution by women. Resource loss, climate shocks, conflicts, and adverse policies affect pastoralists, but their impact is felt more severely by pastoralist women, who have been historically marginalized. Pastoralist women serve as custodians of pastoral livelihoods, culture, and community, and play a key role in adapting to changing conditions. Therefore empowering women by ensuring access to natural resources and economic opportunities is essential for resilient pastoralism.